The method we use is Hot Water Extraction or sometimes known as Steam Cleaning. This method is recommended by nearly all the carpet manufacturers and fibre producers and is the only one classified as ‘truly deep cleaning’. It is also referred to frequently as steam cleaning due to the fine spray of hot water used. In actual fact, because a steam is a gas, not a liquid it is never used on carpets and upholstery. We do not recommend other methods, including dry cleaning as we consider them as light surface cleaning incapable of removing soiling deep down in the pile. Also, most dry methods leave large amounts of cleaning agents in the fabric after cleaning which leads to rapid re-soiling of the newly cleaned carpet or upholstery. 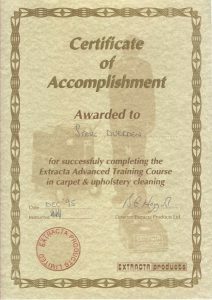 Our technicians are trained to recognise the many different carpet and upholstery fabrics; this enables us to provide the best possible deep down clean every time. We only use self-neutralising alkaline based cleaning products, this means that rapid re-soiling does not occur on the carpets and upholstery we clean. 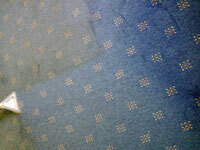 Dull and depressed carpets can be renovated with outstanding results every time. Deep down dirt and grit that cause damage and wear to your fibres can be safely extracted, extending the life of your carpets and upholstery. Our equipment is the finest most powerful portable machines available, ensuring that all carpets and upholstery are ready to be used within hours. 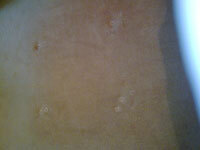 These unsightly markings which become visible when furniture is placed in the same position for a considerable time can ruin the appearance of a room. We have developed a technique virtually eliminating the appearance of this troublesome problem. All carpets, upholstery and rugs can be stain guarded after cleaning, to help resist soiling and prevent liquid spills from becoming stains. Dust and dirt will be easier to remove with routine vacuuming.